Posted on November 18, 2013, in Don Rankin watercolors, Uncategorized and tagged amazon .com, amazon books, create space, i, Mastering Glazing Techniques in Watercolor, The Antique Shop DVD, Vol.I, Watercolor technique, watercolor tutorials, watercolor video. Bookmark the permalink. 4 Comments. Don, I am a little confused. I have both of your books in the older, hardcover editions. Is this a new revised edition of ‘Mastering Glazing Techniques’? If so, does it contain enough new information to justify the cost? Thanks for the question. I’m delighted that you have two of my older books. The cost of the new book is around 31.00 USD retail. Is it worth it? Well, I suppose that all depends upon your viewpoint. changed; new formulations. Those have been updated. I also added 2 new step by step tutorials and 2 new paintings. Finally you will have to be the judge. Don, thank you so much for your fast and detailed reply! I thought about the quinacradones after my e-mail was sent. 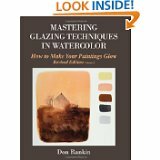 Yes, it seems I will be buying your updated book on glazing with watercolors. I am 64, on disability, have a tight budget and cannot travel to workshops without my husband’s support. However, books and videos like yours provide a wealth of education if a person works hard to put it to use. I sent you a link to my blog, which has not been updated since our middle daughter was diagnosed with Stage IV colon cancer at 33. After she passed, I hit the pits and am working hard now to get back on track. I wish I could study with you in person, but look forward to your blog, book, and videos. You are most welcome. May G-d give you and your family peace.